‣RADAR JAMMERS like what you sell will land people in jail. It's happened. The police will trace you using your registration/number plate, inspect your vehicle...and you'll either get 2,000+ fine plus 6 points on your licence or a few months in jail, lose your job and have a criminal record. They are illegal to use in the UK (and probably most countries too). Use of a RADAR DETECTOR to warn of the presence of speed cameras however is entirely LEGAL. ‣Are there any speed camera detectors which can track/confirm when you have actually been caught by a camera. In addition to giving giving you warnings? If not currently, could this be possible in the future with the technology available today? ‣Is there a unit that will upgrade my on board Porche map system with speed cameras please? ‣If you are in a high fronted van and have the detector on your dashboard, when approaching a camera over a hill top, will the warning be early enough, or will the camera see the top of your vehicle, and nab you first? ‣Do you sell a device which is a satnav dash cam and a speed camera all in one? ‣What is undoubtedly the best comprehensive speed detector device? One that covers all types of camera laser and radar speed traps. ‣Looking to buy a unit, which is the best for stationary vans as I have been 'nabbed' by them twice in a 30mph zone. Also what warning will a unit give in seconds before the camera van actually registers and at what distance please. ‣I have a Jaguar XFS with a head up display, therefore detectors will not work through the special screen. What is available to me? ‣Do any speed cameras detectors tell you if you are exceeding the speed limit other than when you are approaching a speed camera? ‣I'm looking to get something to warn me of mobile speed cameras. What app or device works the best for mobile cameras of all types? ‣Does a speed camera detector, detect the mobile speed camera vans? ‣I have an Apple Mac PC. Which speed camera detectors are compatible for downloading the speed camera updates? ‣I am looking to find a Speed Camera Alert system that will work through the heated windscreen of my Land Rover Freeland2 HSE 2013. ‣Will the detectors that you sell detect laser and radar guns? I've read on other forums that when unit detects it already too late and you are caught. I live in Ireland. ‣Are these detectors legal? I have just read that any windscreen mounted detector must be outside the wiper sweep areaa and it is illegal to watch any camera or screens while driving? ‣ Are you permitted to sell your products to the Republic of Ireland? If so will your devices work here also? ‣ I've recently been caught by two unmarked police cars. My question is will a radar detector pick up the system they are using to track speed? ‣ Are there any motorbike specific speed trap detectors, say with Bluetooth, waterproof etc? ‣Do you have any detectors that can pick up the signals from the new Stealth cameras on the motorways? ‣I am looking for a speed camera detector which will detect all cameras in France. Can you please advise which will be the best one? I thought maybe the snooper 3zero. Also, will the laser blocker for mobile cameras work efficiently with the French mobile camera system? ‣Are speed camera detectors legal to use in the UK? ‣What are the benefits of using a speed camera detector? Do you have a speed camera detector related question? Go to our contact page and submit your question or comment today. New to speed camera detectors? Don't know where to start? Want some independent help and advice? Then view the Speed Camera Detector Buyer's Guide. Alternatively if you have a question about a type of speed camera in use on UK roads (e.g. SPECS, Gatso or Hadecs 3) then please visit our Speed Camera FAQ page. RADAR JAMMERS like what you sell will land people in jail. It's happened. The police will trace you using your registration/number plate, inspect your vehicle...and you'll either get 2,000+ fine plus 6 points on your licence or a few months in jail, lose your job and have a criminal record. They are illegal to use in the UK (and probably most countries too). Use of a RADAR DETECTOR to warn of the presence of speed cameras however is entirely LEGAL. We no longer sell radar jammers. The models we used to sell are now no longer available, having being discontinued by the various manufactures e.g. Target. Radar jammers aren't illegal to use in the UK, but we will concede that there is a grey area in UK law surrounding their use and some motorists have been prosecuted for using one. What we do sell are GPS based speed camera detectors with and without a radar/laser detector module, which as you accept are entirely legal in our target market - the UK. Are there any speed camera detectors which can track/confirm when you have actually been caught by a camera. In addition to giving giving you warnings? If not currently, could this be possible in the future with the technology available today? It is not possible now and will likely not be possible in future for a speed camera detector to confirm whether you have been caught. The main reason being that to provide the information, the speed camera detector company would need access to Police computers and their speed camera database and this is very unlikely. 1. Average speed cameras take a photo of every vehicle passing each camera, judging the time it takes to drive/ride between camera points a ticket is automatically generated. The paired cameras are ONLY known by the police and camera installer. 2. Some cameras run out of film, yet still continue to trigger when a speeding vehicle sets them off. A speed camera detector does not know whether a camera has film or not. 3. A speed camera detector will not know at what speed any particular speed camera is set to trigger and prosecute a speeding motorist. 4. The police may change the speed threshold in which they prosecute a driver/rider for speeding. For example a camera set up in a 30mph enforced zone, may one month be set to trigger at 35mph, the next month the calibration might be changed to 34mph. A speed camera detector will not know this information. For more information about the latest speed camera detectors please see Speed Camera Detector Buyer's Guide. Is there a unit that will upgrade my on board Porche map system with speed cameras please? I would recommend that you speak to Porsche with your query. We do not know the answer. However, even if there a POI speed camera database it will not be as good as a dedicated speed camera detector. A detector such as the Snooper 4ZERO Elite BT features a free to update GPS POI database and in addition a radar and laser detector. No Porsche map system would be able to detect radar and laser signals. The Snooper 4ZERO Elite BT forward and rear facing radar and laser detector will detect radar/laser based cameras e.g. Gatso and handheld guns in front of your vehicle, behind your vehicle and on either side of the road. For the optimal performance of the Snooper 4ZERO Elite BT built-in radar/laser detector it needs to see the road ahead of and behind your vehicle. The best place to position the Snooper 4ZERO Elite BT is in the centre of your vehicles windscreen low down, but high enough to see over the windscreen wipers/bonnet and out the rear window over your vehicles parcel shelf. If you are in a high fronted van and have the detector on your dashboard, when approaching a camera over a hill top, will the warning be early enough, or will the camera see the top of your vehicle, and nab you first? It depends upon the speed camera in use. While this could be true of a mobile speed cameras, it almost certainly won’t be true of fixed speed cameras. Subsequent question: So does the detector need line of sight to a mobile camera, or will it detect a mobile camera over a hill top please? Subsequent answer: It firstly depends on the technology in the speed camera detector. Some detectors like the Cheetah c550 (pictured right) and Snooper MY-SPEED XL only use a GPS database. If the speed camera fixed or mobile is in the GPS database you will receive an advanced alert from a set distance e.g. 500metres - hill top or no hill top. Other detectors like the Snooper 4ZERO Elite BT feature a GPS database plus a radar and laser detector. If the laser detector is used to detect the mobile speed camera then this only works with line of sight. Laser beams only travel in a straight line. Radar beam can be much wider and will bounce of objects e.g. other vehicle, buildings, etc, so it is possible to detect ‘radar scatter’ over a hill top. The vast majority of mobile speed cameras operating in the UK use laser guns. Do you sell a device which is a satnav dash cam and a speed camera all in one? We do not sell a combined sat nav with radar and laser detection for live alerts to mobile speed camera vans/handhelds etc. If you require a device with radar and laser detection, then you will need to buy a dedicated speed camera detector. The best and only one we sell to include GPS database (free to update), radar detector and laser detector is the Snooper 4ZERO Elite BT. What is undoubtedly the best comprehensive speed detector device? One that covers all types of camera laser and radar speed traps. The most comprehensive speed detector device we sell is the Snooper 4ZERO Elite BT. Only the Snooper 4ZERO Elite BT includes both a radar and laser detector to detect live ‘in-use’ mobile speed cameras vans and police handheld guns. The Snooper 4ZERO Elite BT also features a comprehensive GPS database of fixed and mobile speed camera locations. The Snooper 4ZERO Elite BT is our best selling speed camera detector for two main reasons 1. it includes GPS, radar and laser technology – alerting to more camera types than any other detector we sell, 2. GPS database updates are FREE to update for the life of the product. The predecessor to the 4ZERO Elite BT, the 4ZERO subscription costs were £29.99 a year. Looking to buy a unit, which is the best for stationary vans as I have been 'nabbed' by them twice in a 30mph zone. Also what warning will a unit give in seconds before the camera van actually registers and at what distance please. The best speed camera detector for stationary vans is the Snooper 4ZERO Elite BT. Only the Snooper 4ZERO Elite includes both a radar and laser detector to detect live ‘in-use’ mobile speed cameras vans and police handheld guns. ‣The alert range for range for radar is typically a few hundred yards. ‣The alert range for range for laser is anything up to 1 mile away. Please note: The Snooper 4ZERO Elite BT will ONLY provide a warning when the unit’s internal radar / laser detector is triggered. This warning may be too late. For example if you were the only vehicle on a road, the Police/camera operator lies in wait, he/she presses the laser/radar gun trigger, you receive a warning the camera operator receives your speed. In this scenario the mobile speed camera operator only takes and uses a single reading to aid in the prosecution. However, in addition to a radar / laser detector, the Snooper 4ZERO Elite BT also features a GPS database of fixed and mobile speed camera locations. This database is updated everyday and will provide advanced warning of fixed and mobile speed camera sites from 300 metres. I have a Jaguar XFS with a head up display, therefore detectors will not work through the special screen. What is available to me? The best and only option would be to purchase the Cheetah c550 speed camera detector and ADDITIONALLY buy the Cheetah c550 external GPS antenna to use with it. The Cheetah c550 external GPS antenna features 5 metres of cabling enabling you to locate the GPS antenna in a suitable place within or on your vehicle to achieve a GPS satellite fix. Do any speed cameras detectors tell you if you are exceeding the speed limit other than when you are approaching a speed camera? Yes, the Snooper MY-SPEED XL includes all road speed limits for the UK and Western Europe, displaying them on an impressive 4.3-inch touchscreen display. If you are driving at or below the speed limit, the screen is green, if you are driving above the road speed limit, the display turns green. Speed camera locations are also included and best of all both databases are free to update. I'm looking to get something to warn me of mobile speed cameras. What app or device works the best for mobile cameras of all types? I would prefer to be notified with an audible response. The only device to provide alerts to the mobile speed camera locations is a radar and/or laser based detector. I would recommend that you consider the Snooper 4 ZERO Elite BT. The 4ZERO features a GPS database of fixed and mobile speed camera locations, plus a radar and laser detector. No app includes the ability to detect radar and/or laser guns. You need a device that has that capability. Does a speed camera detector, detect the mobile speed camera vans? Yes, just so long as it includes technology that can detect live 'in-use' mobile speed cameras. To detect mobile speed cameras you need to buy a device with a radar and/or laser detector. 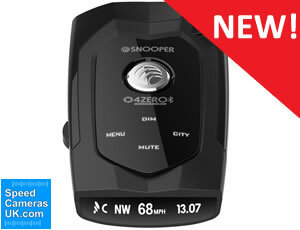 I would recommend the Snooper 4ZERO Elite BT, which features both radar and laser detection. I have an Apple Mac PC. Which speed camera detectors are compatible for downloading the speed camera updates? The only speed camera detector we sell which is Apple MAC compatible is the Snooper 4ZERO Elite BT. The 4ZERO Elite BT is also compatible with Windows PC. I am looking to find a Speed Camera Alert system that will work through the heated windscreen of my Land Rover Freeland2 HSE 2013. So far I have tried, and had to return because of failure to operate, the following: Cheeter 550, Inforad and Aguri Skyway. All failed to receive the satellite signal. Alternatively can a GPS database be installed via USB stick as additional POI on the built in DENSO GEN 2.1 Sat Nav that the vehicle was supplied with? 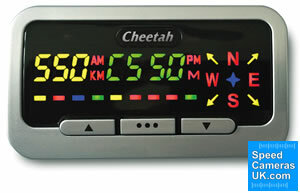 Your only and best bet would have been to keep the Cheetah c550 (pictured below, and available in either silver or black) and in ADDITION purchase a separate GPS antenna. This would have enabled you to receive a GPS signal by placing the GPS antenna elsewhere in your vehicle. No other speed camera detector has the option to plug in an external GPS antenna only the Cheetah c550. Will the detectors that you sell detect laser and radar guns? I've read on other forums that when unit detects it already too late and you are caught. I live in Ireland. ‣You are the only vehicle on the road at the time, the Police/camera operator waits for your vehicle to come into to range. He/she then presses the button to activate their laser or radar gun, you receive an alert via the radar/laser detector, but the Police/camera operator also receives the speed of your vehicle. ‣You are targeted when coming round a bend or over the brow of a hill. A radar/laser beam can only travel in a straight line. The best way to receive an advanced warning to a mobile speed camera location is via a GPS database. The Snooper 4ZERO Elite BT in addition to featuring radar and laser detection, also features an updateable GPS database of fixed and mobile speed camera locations, including those in the Republic of Ireland. Are these detectors legal? I have just read that any windscreen mounted detector must be outside the wiper sweep areaa and it is illegal to watch any camera or screens while driving? Speed camera detectors are 100% legal to use in the UK. Smart phones, sat navs, dash cams, speed camera detectors and other in-car devices should not be mounted within the area of the windscreen covered by the windscreen wipers. Are you permitted to sell your products to the Republic of Ireland? If so will your devices work here also? For use in the Republic of Ireland the Snooper 4ZERO Elite BT is our best seller and the detector I would recommend. The 4ZERO Elite BT includes radar and laser detection and a GPS database for known mobile and fixed speed camera locations throughout the ROI. Updates wirelessly via either a Bluetooth device with data e.g. a smartphone or via a computer running either a compatible Windows or a Apple MAC operating system. Updates are FREE for the life of the product. Delivery to Republic of Ireland is £14.99. 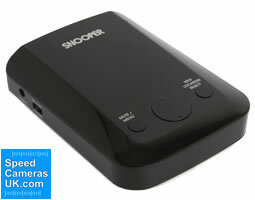 We have sold many Snooper 4ZERO Elite BT's to customers in the Republic of Ireland. I've recently been caught by two unmarked police cars. My question is will a radar detector pick up the system they are using to track speed? A radar detector will ONLY detect in-use Police radar handheld guns, the same principal applies to a laser detectors. The Police can and do use several different methods to record/capture a speeding motorist. One of the most common is to simply use the vehicles built-in CCTV system. The unmarked Police vehicle follows the target/speeding vehicle for a set distance (normally 3 miles) recording the vehicles speed on the CCTV. When the Police deploy this method there is unfortunately no way to detect and warn of the unmarked Police vehicle following your vehicle. Are there any motorbike specific speed trap detectors, say with Bluetooth, waterproof etc? No, there is currently nothing on the market that is designed for use while on a motorbike. In the past has there have been a few systems, but these have all been discontinued. Do you have any detectors that can pick up the signals from the new Stealth cameras on the motorways? To detect the new HADECS 3 'stealth' speed cameras you need a detector with a good GPS database. I would recommend the Snooper 4ZERO Elite BT. More information about HADECS 3 cameras and the speed camera detectors that will provide alerts to them can be found here. I am looking for a speed camera detector which will detect all cameras in France. Can you please advise which will be the best one? I thought maybe the snooper 4zero elite bt. Also, will the laser blocker for mobile cameras work efficiently with the French mobile camera system? 1. The GPS database includes locations where there could be a speed camera (to comply with French law), you need to opt into this option. 2. The units built-in radar/laser detector will detect in-use cameras operating using the radar and laser bands. However, it is ILLEGAL to use a radar/laser detector in France to warn of speed camera locations. A motorist seeking to buy a replacement 3ZERO a few weeks ago had his last one confiscated by the French Gendarmerie. In addition he had a fine of 1500EUR! I would suggest you steer clear of a laser jammer as if and when the Gendarmerie fire a laser gun at you vehicle and don't receive a reading on their laser gun, they will almost certainly pull you over and search the device jamming the signal in your vehicle. A radar/laser detector on the other hand doesn't interfere with the signal in anyway, being completely passive - but is still illegal to use in France. Please note: Having a device with radar and Laser detection in the UK is completely legal to own, use and operate. Are speed camera detectors legal to use in the UK? It is currently 100% legal (October 2017) to use a speed camera detector in the UK to warn of all speed camera locations - fixed and mobile. Legislation implemented on the 27th January 1998 made the detection of speed cameras a lawful activity. More recently the Government, through the Road Safety Bill, is reviewing the use of speed camera detectors and their technologies in the UK. The Road Safety Bill looks to ban speed camera jammers and detectors. To fully understand the implications of the bill first you need to understand the different types of speed camera detectors that are available in the UK. There are currently three different technologies that a speed camera detector could utilise to detect and warn of an approaching speed camera. Speed camera detectors can use Radar detection, Laser detection and GPS (Global Positioning Satellite) a combination of one, two or all three of the technologies can be used. As a Radar detector warns by detecting a camera in the road ahead. Legality of these systems are under review, as they potentially allow a motorist to drive above the speed limit without facing prosecution through an in active road side speed camera. GPS systems such as the Origin b2 warn via a national database of speed camera locations, whether the road side speed camera contains operational equipment or is simply empty. The following is a extract from the Department for Transport (DFT) website "The Government will not be prohibiting those devices that rely on Global Positioning System (GPS) technology to warn drivers of published camera sites or posted speed limits, as these compliment the Government's policy to ensure that camera sites are visible and conspicuous to drivers, and so help deter excessive and inappropriate speeds on the roads." To read more about UK government policy regarding the legality of speed camera detectors see UK Law relating to speed camera radar detectors. What are the benefits of using a speed camera detector? More and more motorists are discovering the benefits of driving with a speed camera detector. The main benefit being advanced warnings of speed cameras in the road ahead and avoiding points, fines and potential loss of a driving licence. In addition GPS based systems also provide the driver with spoken voice alerts and speed limits at camera sites. So if driving in an unfamiliar area the driver knows what speed his vehicle needs to be doing to drive within the law and avoid a speeding conviction. 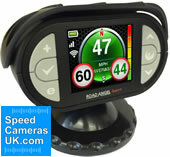 For more information regarding speed camera detectors see Speed Camera Detector Buyer's Guide.